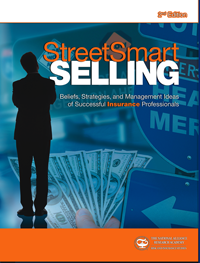 Street Smart Selling allows you to understand your basic sales beliefs and know what motivates you to endure, succeed, and survive change in the arena of insurance sales. This guide helps you understand the basic marketing strategies to attract qualified prospects by positioning yourself as an insurance expert. (Print) $45.00 + shipping | Buy Book Now! (eBook) $35.00 | Buy Book Now! © 2014 Lamont Consulting Group, Inc. All Rights Reserved.